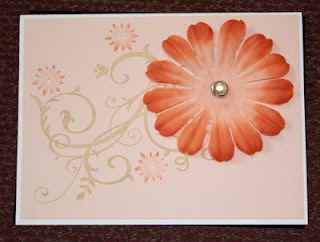 This floral, elegant card was created using the Blush Blossom/Groovy Guava/River Rock color combination. However, it would look wonderful using many other combinations, and can be used for many/any occasion! Stamp large swirl in River Rock. For small flowers use Rock-n-Roll technique: Stamp image in base color, Blush Blossom, then roll the edges of the stamp in the darker ink, Groovy Guava. Then stamp on cardstock. Repeat as necessary. Try to keep towards the edges of the paper since the small flowers will be pierced (so the white cardstock shows through. Or you can add other brads/rhinestones). Dye the large flower: Rub edges in Groovy Guava, then use Blush Blossom refill to cover the rest of the flower. Allow to try for a short while. Then use napkin, cover, and push down to absorb excess ink. Punch Blush Blossom cardstock, lay flower, put clear rhinestone brad through all. Adhere Blush Blossom cardstock to Whisper White cardstock (card front).